5 is a pleasant number. It’s a prime in its own right and is also the sum of the first two primes, 2 and 3. In addition (can you anticipate the pun? ), 5 is the sum of the squares of two consecutive integers, 1 and 2. Those lesser integers 1, 2, and 3 are Fibonacci numbers, as is 5 itself. The most common stylized star that people draw has 5 points. Some plants have compound leaves with 5 leaflets. Other plants produce flowers with 5 petals or rays or stamens or sepals or bracts. If I’m dwelling on the number 5, it’s because today marks the fifth anniversary of daily posts in Portraits of Wildflowers. Who’d have expected such day-after-day fidelity? Not I, going into it, yet WordPress tells me today’s post is number 1986 (on some days I did more than one). Breathe and drink and eat we must, but five years is a long time for a voluntary daily activity to last. Now I think it’s time to ease the pace a bit and not feel honor-bound, or maybe more realistically obsession-bound, to post every single day. There’ll still be plenty to see and show, especially as this has been a good wildflower spring. Here are two examples of that. 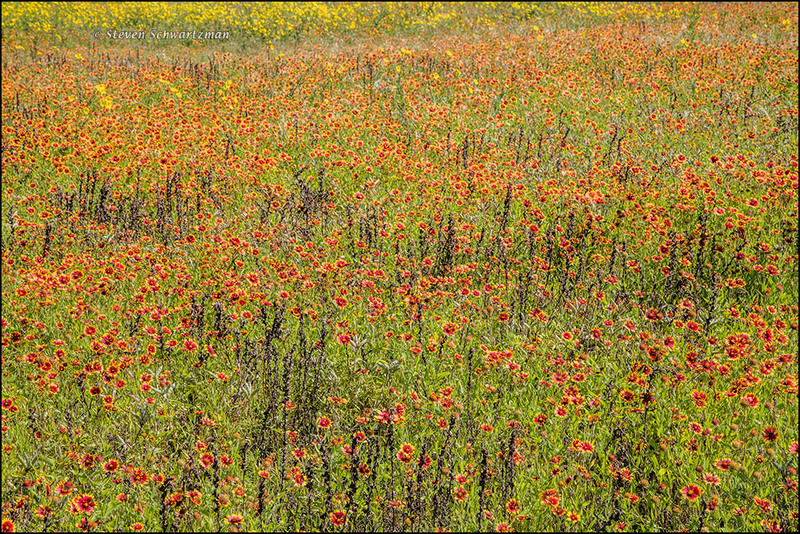 The first photograph portrays a colony of Gaillardia pulchella (firewheels, blanket flowers, Indian blankets) with some Engelmannia peristenia (Engelmann daisies) in the background along TX 20 east of Lockhart on May 3. 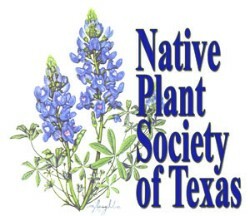 Note in the lower left the seed pods of some Lupinus texensis (bluebonnets). The dark, dry vertical plants scattered among the firewheels seem to have been the remains of Indian paintbrushes (Castilleja indivisa). The second example of this spring’s great wildflowers comes from a still-undeveloped property along Louis Henna Blvd. in southern Round Rock on May 17. 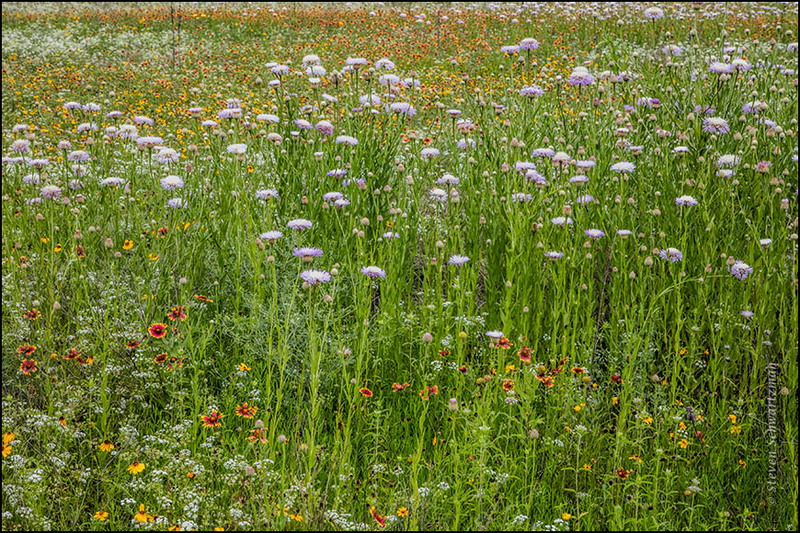 You’re looking at basket-flowers (Centaurea americana), Indian blankets (Gaillardia pulchella), greenthread (Thelesperma filifolium), and prairie bishop’s weed (Bifora americana). Landscapes are good when they’re abundantly floral. From August 31st along Oasis Bluff Dr. out in the Texas Hill Country northwest of Austin comes a native species you’re seeing here for the first time, Stenosiphon linifolius, known as false gaura, but I assure you the blossoms and buds in the photograph are the real thing. They form implausibly long and slender floral spikes that can rise taller than a person. Click for larger size and better quality. 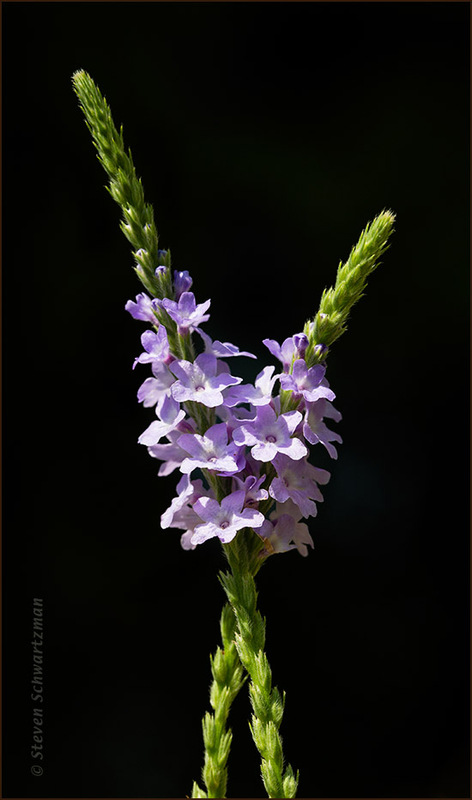 Here’s a photograph from a year ago today in Pflugerville’s Northeast Metro Park showing two crossing flower stalks of Verbena xutha, known as gulf vervain. If you’re interested in photography as a craft, you’ll find that points 1, 2, 4, 6 and 18 in About My Techniques apply to this photograph. Taking a one-day pause in the sequence of geological and climatological photographs that predominated at the end of the New Zealand trip, let’s back up a few days for one more picture from my February 21st visit to Wellington’s Zealandia. 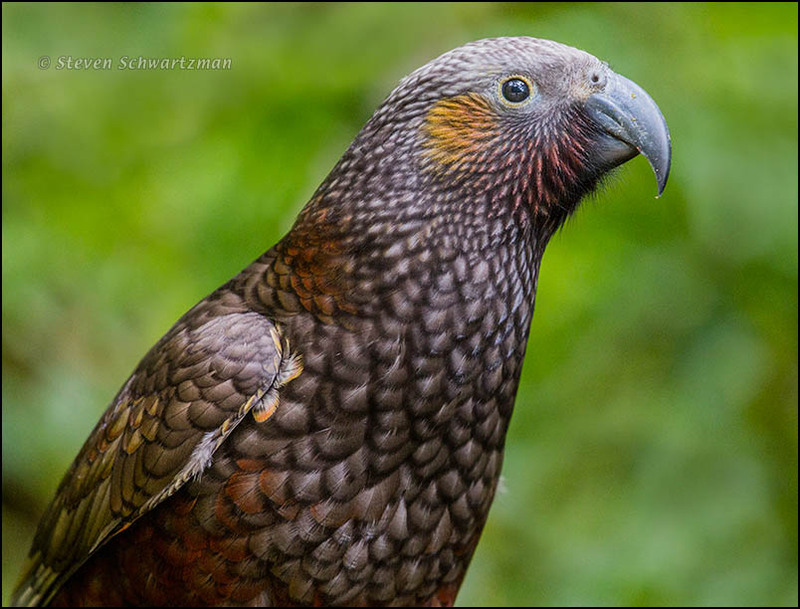 There I managed to get several portraits of the native parrot Nestor meridionalis, which I assume got its Māori name of kākā from the sound the bird makes, much as English transliterates the repeated call of a crow as caw caw. There are two subspecies of kākā, and this appears to be the northern one. You’re welcome to read more about the kākā, whether a current overview or a historical account. No, this post’s title doesn’t refer to some rare species, but who’d expect to find a coreopsis plant alive and apparently still thriving as it drifts sideways in an unaccustomed current? You see, the record rains of May had temporarily turned a ditch along Burnet Rd. by the old Merrilltown Cemetery in far north Austin into a brook. 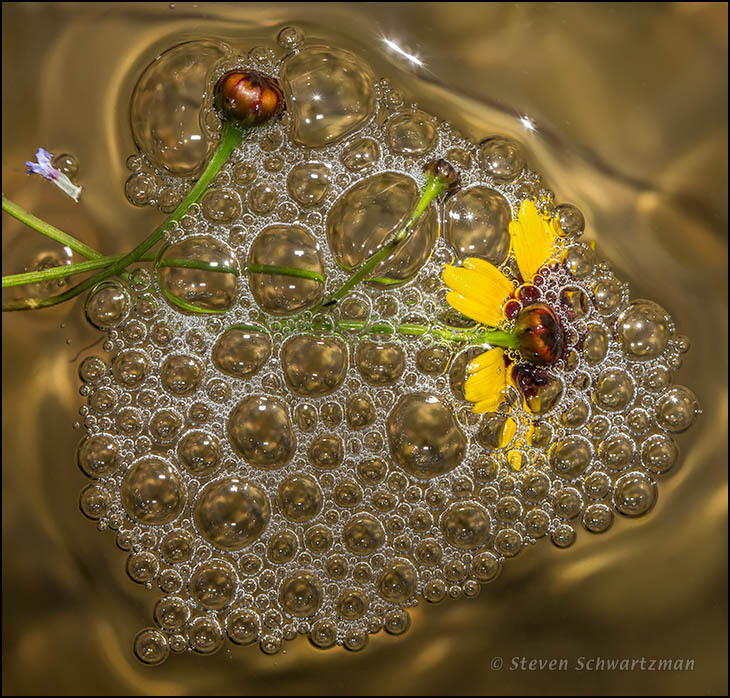 When I stopped there on May 29th, little rafts of bubbles kept flowing by and briefly clinging to the buds and flower head shown here before being swept south, while the coreopsis, still rooted, could undulate in the water without being swept away. This is the second time you’ve recently seen coreopsis in an unaccustomed way, the first being as a dense colony covering parts of a Galveston cemetery. Today is the official birthday of the United States of America, which now enters its 240th year as a nation. The country has its share of problems—which country doesn’t?—but let’s hope for a resurgence. 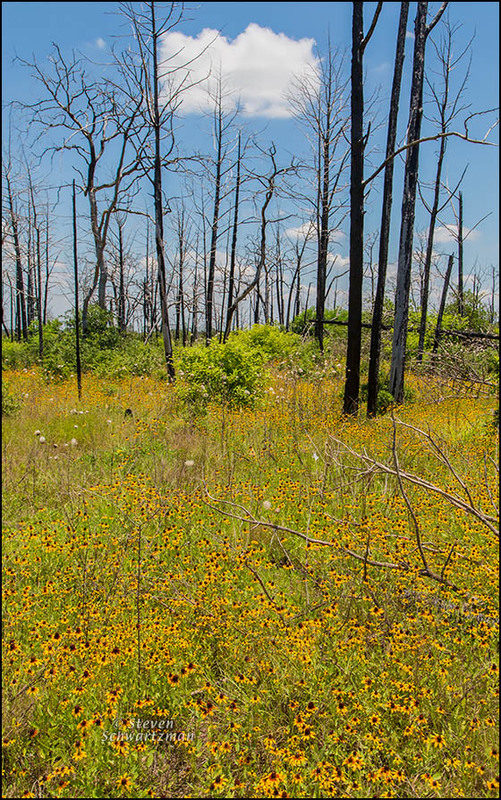 On that theme, some of you will recall, and others of you will now learn, that in September of 2011 a huge fire burned for days and destroyed most of the pine forest in Bastrop State Park, along with over 1600 nearby homes. In the first spring after the devastating fire I posted some early evidence of recovery in the form of a prominent white prickly poppy flower whose pristine brightness contrasted with the burned pines beyond it. One month ago today I went back for my first visit to the area in 2015, and the colorful views that I saw in many places encouraged me. Here’s one showing how densely the brown-eyed (or black-eyed) susans, Rudbeckia hirta, were flowering. In order of prominence, this photograph offers you blue, white, and at the bottom a bit of red, so a happy reversed red, white, and blue to you on this Independence Day.